On this page we gather YELLOW jewelry and handbags! It's spring and summer, and this is a beautiful splash to add to an outfit...maybe you cannot wear a yellow dress, but you can certainly do the yellow purse accent, or pick up a bit of yellow in your print with some yellow earrings. 2 inches long on sterling earwire. A piece of brass has distressed texture with oxidized finish, suspended below bronze crystal and dark mustard color bead on iron wire. By The Artful Soul, 18 inch beaded necklace in yummy yellows. There is tigers eye gemstones, Swarovski crystals, foil with roses glass, millefiore rose glass, vintage Czech glass and seed beads of various finishes. The largest center bead is 14mm, ends with goldplated toggle clasp. By The Artful Soul, this is part of a pale yellow geometrics polymer clay collection, lemon chiffon, pale harvest and ivory white. Detailed handbuilt patterns are sliced and mounted onto background clay, accented with silver leaf, then fired. Light and artful. Pendant measures 2-3/8 x 1-5/8 inches, tied onto ivory satin cord at 27 inches long (no clasp). Pin measures 1-1/2 x 1-3/4 inches, horizontal barpin clasp to wear as shown. Earrings are 5/8 inch wide, 2 inches long on surgical earwire. 1-1/4 x 1 inch earrings have surgical post located 5/16 inch below top edge. 1-5/8 inch pendant is suspended from 17 inch ivory satin cord, lobster clasp. About 23 inches long, but with the zig-zag style of each strand there is opportunity to relax a bit longer or twist tighter! 9 strands are beaded with shiny small glass beads, folded along the way into points that end with crystals and gemstone chips. Strong back magnetic clasp for easy on and off, is hidden in beaded caps. 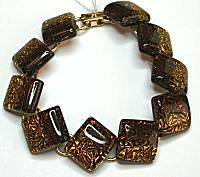 The glass bead colors include jonquil and topaz yellow, crystals in golden champagne, stones includ tigerseye. 5/16 x 11/16 inch slender open aluminum rectangle has spiral embossed pattern and colored lemon-lime with tiny dangling bead. 1-1/2 inches long on sterling earwire. Elegant shiny lemon yellow patent leather wallet has shiny golden hardware along flap edge. Measures 7-1/2 x 4 inches. Closes with 2 magnetic snaps without effort. Interior is lined in metallic gold leather (or could be nice faux). Has center section with bill slot and 6 card slots. At end is a gusseted large pocket, that has attached a checkbook slot and zipper coin purse, ID window and 4 more card slots. Bravo Bags by Foxy Goods are made with luxurious cowhide leather, sturdy but supple. Clean lines and contemporary hardware are a signature feature, all labelled "Bravo USA". Simple 3/8 inch teardrop shape is set with surgical post and studded in tiny Swarovski crystals and glass beads. The colors look more brilliant than in the website image, they include jonquil lemon yellow, rose pink, pale lavender and dark gray. 5/8 x 1/2 inch rectangular pendant features the large rectangular and fully faceted crystal in pale lemon yellow with AB surfaces that reflect other colors. Bands of black and purple on the sides and golden corner beads accent the stone. Suspended from steel chain, 16-18 adjustable length, lobster clasp. 1-1/2 inches long including silver-plated earwire, 3/4 inch across. The lasercut single wood piece depicts tulip blossom. Tint color is mustard yellow. 1/2 inch square of fused dichroic glass, deep golden topaz and smoky brown with textured background that looks like gold shards sparkling within. 1-14 inches long on surgical earwire. 5/8 inch round pendant of sterling silver with different paper designs sealed under clear acrylic on each side. It is reversible...designed to lay flat and not flip when worn, so you can choose which side to show today! Comes on delicate 18 inch sterling chain. 7/8 inch long rectangular pendant of sterling silver with different paper designs sealed under acrylic coating on each side. It is reversible...designed to lay flat and not flip when worn, so you can choose which side to show today! Comes on delicate 18 inch sterling chain. 1-1/4 inches long on sterling earwire, 5/8 inch across. The square is fused dichroic on top of black background, the color is sparkling deep sunflower yellow with hint of lime. Matte rose-gold plated metal settings and chain (may contain nickel), 3/8-5/8 inch wide and 7 or 7-1/2 inches long depending on which ring you clasp with. Lobster clasp, heart and crystal charm, signature tag. Larger element at center has rectangular golden champagne crystal with peach and champagne smaller ones around it. The other pair of fancy elements are smaller crystals set onto a textured metal design. Simple rectangles of the golden champagne crystals link between them. Matte rose-gold platted metal settings (may contain nickel) form earring that is 1/2 x 9/16 inch vertical rectangle with post 1/8 inch below top edge. At center is a sparkling golden champagne crystal, surrounded by smaller peach crystals. A sparkling and warm combination. 17 inches long, goldtone magnetic clasp for easy on and off, made on goldplated wire that you can bend to fit your neckline perfectly! Tiny bronze iris beads make the back of necklace comfortable. 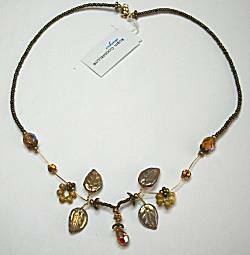 Spanning the front 5-1/2 inches are antiqued bronze metal beads that add the vintage look, twisted wire extends out to capture mustard yellow glass and topaz yellow crystal beads, glass leaves in polished peachy-bronze reflective colors. Leafy tendrils extend delicately outward up to 3/4 inch. 1-1/2 inch wingspan of the flying bee with bright yellow body. The wings have pearlescent finish and scrolling details that work with the hard wire scrolled antennae.